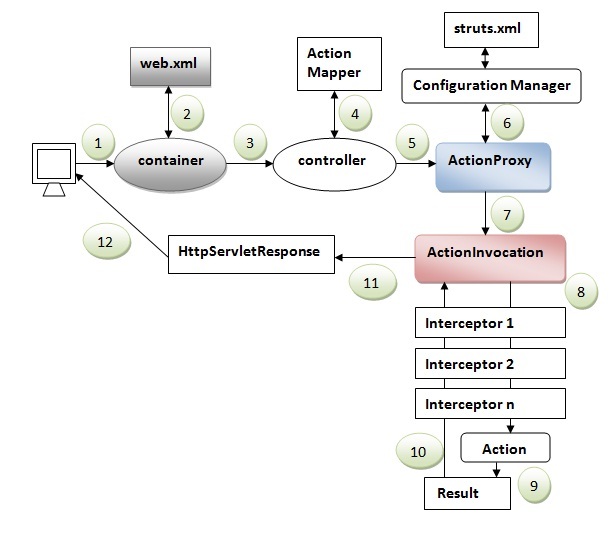 The architecture and flow of struts 2 application, is combined with many components such as Controller, ActionProxy, ActionMapper, Configuration Manager, ActionInvocation, Inerceptor, Action, Result etc. Container maps the request in the web.xml file and gets the class name of controller. Container invokes the controller (StrutsPrepareAndExecuteFilter or FilterDispatcher). Since struts2.1, it is StrutsPrepareAndExecuteFilter. Before 2.1 it was FilterDispatcher. ActionProxy gets the information of action and interceptor stack from the configuration manager which gets the information from the struts.xml file.